When you are faced with a glut of similar looking laptops it can be something of a problem choosing which one is right for you. Lenovo knows this and has tried its best to come up with an eye-catching design for its latest Ultrabook, the ThinkPad S440. Lenovo also got its chisel out and smoothed the edges of the screen as well, giving the S440 enough design flourishes so you will happily whip the laptop out as an everyday device even though it has been made with IT departments in mind. When we go hands on with the S440 at IFA, we were instantly impressed with the laptop. It's certainly a powerful thing. It comes with up to an Intel Core i7 processor (from the latest Haswell generation) and either 250GB SSD storage or up to a TB of hard disk space. There is also whole load of connectivity on board, including Bluetooth, HDMI, Gigabit Ethernet, USB 3.0 and that all important four-in-one card reader. But it is the screen that impresses most. It's a matte multi-touch display, which means that it is much more forgiving when you prod it with your fingers. We tried out a number of touch applications on it and it was really responsive. It's all powered by an AMD Radeon HD 8670M 2GB discrete graphics card. However, we weren't that impressed with the viewing angle and it didn't look that bright under the glare of showroom lights. There were a number of other features that stood out, too. It's always great to hear Dolby Home Theater technology thrumming through the speakers of a laptop. Then there's the optional voice and motion control. Similar to what is found in the Lenovo Yoga 2 Pro, this technology means you don't have to lay a finger on the screen or keyboard for a variety of tasks. And when it comes to battery, while the quoted nine hours is pretty impressive, what is more impressive is that the laptop will charge up in just 45 minutes - which will be a deal maker for many. 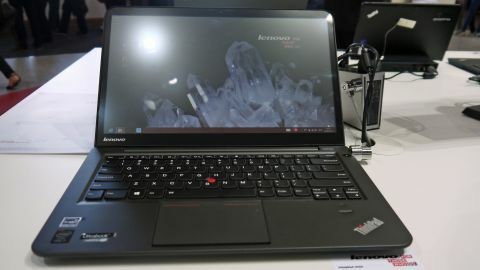 Lenovo has put a lot of effort into the Lenovo ThinkPad S440 to make sure that it isn't lost among the stream of Ultrabooks being released and on our first impressions, it has managed to do this and a bit more. The Lenovo ThinkPad S440 is available now for 1200 Euro. A US release date is yet to be announced.